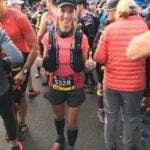 Kerri runs ultra marathons. She also can't feel her feet. "I run ultra marathons but can't feel my feet." My life was full of dreams and aspirations; a precious little bucket list of things like hiking Machu Picchu and surfing in Hawaii. But that all changed in the blink of an eye when I walked into the Neurologist’s room and was diagnosed with Peripheral Neuropathy. This disease isn’t necessarily life threatening, but for me it threatened to take away the life I had so haphazardly wasted and all the adventures I naively assumed I had time for. So, what exactly is Peripheral Neuropathy? For me it manifests itself in constant pain shooting down my legs; think the sensation of ants biting you all over, constant migraines, with one lasting for 45 days. Both my feet are almost completely numb, and my right hand is heading in the same direction. The diagnosis left me feeling very conflicted as it answered so many questions but brought up so many more. I was constantly tripping over but had put it down to clumsiness, I hadn’t realised how much mobility I’d lost due to the muscle wasting in my leg and episodes of foot drop. This diagnosis gave me some relief that there was an explanation for it all, but also made me wonder what was in store for the future. At this time I was 37 years old and I came to the realisation it was only going to get worse from here on out. I had to quit dancing which had always kept me fit physically and mentally so I gained weight and my mental health took a beating too. At the time I was working as a caseworker in aged care and I began to worry that my very livelihood would also be in jeopardy. I began hydrotherapy and did mild exercise every day, including a quarter of a lap of the pool. The next step for me was to see an orthotist, and he got me an Orthosis (leg brace) to help me stay upright, but this necessary device led to more personal problems that I couldn’t have anticipated. I went to buy some shoes to accommodate the new part of me, but there isn’t a lot that fits like a jogger to hold in a brace, so my confidence just continued to spiral downward. No more skirts and heels; the simple pleasures I was used to. Wearing the brace I felt like I was losing myself, people would stare at it, meanwhile I would try to smile at them, but they wouldn’t even notice that, they would only look at what was wrong with me; it was things like this that really affected me. People didn’t realise they were doing it, it’s human nature to be curious but it is something to be aware of if you come across someone with a disability. During this time, I lost my mum which was so hard. I have four children so I knew I had to keep it together on the outside for their sake, but on the inside it was almost unbearable. There is not a day that goes by that I don’t miss her and part of me carries on for her, I know she’d be proud. When tragic events accumulate like this you need to make a decision: either I am going to get up and own my life, or I’m going to crawl up in the foetal position and never leave my bed. My decision was made when my husband Brad and I were walking around the lake and, while I was walking as fast as my body would allow me to, an older gentleman walked past me. This was my breaking point. I lost it. I just kept thinking that this wasn’t fair, that I am too young for this. What will I be like in 10 years time? This is MY life and I need to take control back right now! The process of finding Kerri took three very long, very hard years, but I discovered more about myself in that time than I did in the 37 years prior. I ate healthily, walked and did an hour of exercises every single day to help strengthen my legs. It was frustrating as my progress was so slow, but I persisted. Starting first with short walks then progressively increasing my distance. There was a lot of mental conditioning too as I had to reassure my mind that, although I couldn’t feel my feet, I knew they were still there, it is quite a bizarre feeling. Next, I did walk/running intervals on flat ground. I had good days and bad days as the pain in my legs was unbearable and so frustrating, but looking back it was just a necessary part of the journey. Then I decided that I was going to run in the mountains. I have never been a runner so I don’t really know why, but sometimes things happen in strange ways. Then tears and tantrums unfolded. It was hard work trying to lift up my foot just to get up a hill but my gosh, when I eventually got there after four years of wanting it, I climbed my first mountain and the self-satisfaction I felt from this accomplishment was so awesome. I had never been more proud of myself! Through conquering that climb I had proved to myself that whatever I set my mind to I could achieve! I have since completed runs such as Alpine Challenge 60km, Bogong to Hotham 34km, Buffalo Stampede 42km, 4 Peaks Challenge to name a few. For me, being able to run in the mountains is where I find the most peace as I know it is where I belong and I know this is what I am meant to do. My most recent challenge was a 50km trail run for Ultra-Trail Australia, where my training included running for 50-74 hours per week and spending 1 hour a day in strength and conditioning. The night before the race the course was changed due to the weather, which really didn’t worry me too much besides the Tarros Ladders, which is a ladder set up against a rock face that you climb down, and not being able to feel my feel and my fear of heights made me start to worry. But as I always say, it is what it is, deal with it when you get there. On the morning of the event I was both nervous and excited, but was just happy to get to the start line. The race itself was absolutely beautiful; the trails, the people, just the event and how every detail is so well planned. I ran really well and even got down Tarros Ladder. I could’ve taken an alternative route but decided that I would never have the opportunity to do it again, so why not? Everything was going smoothly until checkpoint two when I started to feel ill. Turns out the medication for Peripheral Neuropathy had messed around with my kidneys (first time ever!) so I backed right off and then one of my friends Jess from Alpine Trail Running decided to run with me. We got to checkpoint three, I chatted with the doctor on duty and got the all clear to go on, as long as I went slow and called if I got worse as it could lead to permanent damage if I pushed it. At that point I felt a lot better, Jess and I talked, laughed and had a great run together and I have made a friend for life, for me this is what trail running is all about: the journey. We both crossed the finish line together in a reasonable time of 7hrs 23mins. After I finished the run I felt so happy, and I just hope that people see that If I can do this, you can too. My daughter Kira ran in her first ever UTA event too, the PACE 22km, and she smashed it in 3hrs and 20mins, gosh I am proud of her! Kira was never a runner and started when she saw the positive impact that it had had on my life. I believe that everything happens for a reason and as much as living with my condition has been hard, I would not take it back now, as it has shaped me into the person I am today and has totally changed my life and the icing on the cake is it has changed Kira’s as well, as a parent you couldn’t want anything more.